Did you guys hear about the new Foreever Rembered exhibit under Atlantis? This is huge. I think I'll be making a trip over there just to see it. I am going to make another trip to KSC on Wednesday. 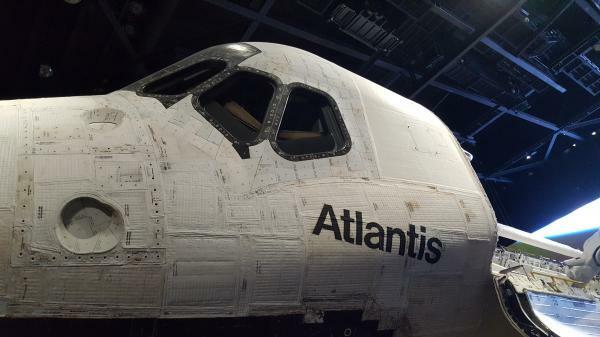 In addition to the tour of the LCC, I am sure we will stop in to see our old friend, Atlantis! I tried out the panorama feature on my camera yesterday. I Just had the greatest opportunity to visit Atlantis with my wife Emily this past Holiday, Wow so many people at the visitors center. Tears of joy were in our eyes as we shuttled through the Atlantis Visit. Wow!! We went to see our old pal Atlantis a few weeks ago. 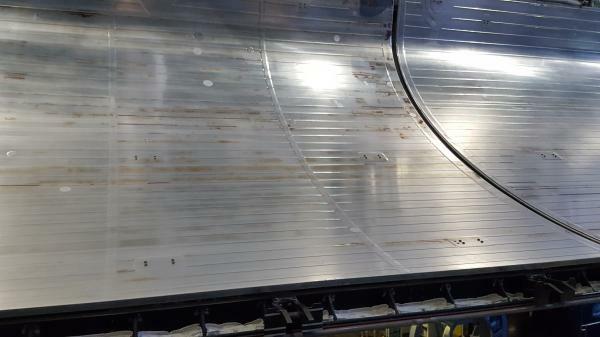 I noticed what appears to be a strip of rubber or metal hanging from one of the SSME. I hope she isn't falling apart already. Someone took her out for an orbit and forgot to do a circle check afterwards. Space Transportation System, such a great synergy of (wo)man and machine, something to never be experienced again. IIRC, those SSME's are not actual flight hardware but mockups as the SSME's will be used on SLS. They WERE flight hardware. They used old engine bells. A new model is sitting under Atlantis. It is a model of a Dragon docked to a Bigalow module. It has almost no signage, an may just be parked there for now. No I didn't get time to do a complete one from her business end, but I took some extreme closeups anyway for those of us who like to see every little detail. Will post the rest once I finish stitching them. I saw Atlantis two weeks ago. I got tons of reference of her to finish a kit i'm building. She's beautiful. I had a blast today at the visitor center in front of Atlantis. There were a hand full of ex shuttle engineers in front and I chatted 2 solid hours with them. It was a uncanny view behind the scenes! I will not reveal their identity, but one of them actually worked on 105 shuttle missions. Being an engineer with some math background was the perfect mix for him, we talked Life, the Universe and everything. The algebra of vector spaces (or lack thereof), JWST vs. Hubble, many things. He said at the end it was his best talk in years. I am so vary glad to have that experience too. Also, he had a real shuttle tile with him and handed it around. I held a real shuttle tile in my hand. It was wrapped in plastic to not be damaged by the people but man that was cool! I had to fight tears at that moment (still have to while writing this). Also he had samples of other parts of the insulation. I dont know any other place like this. The other engineer showed me bits and pieces of the orbiter that he, personally fixed. 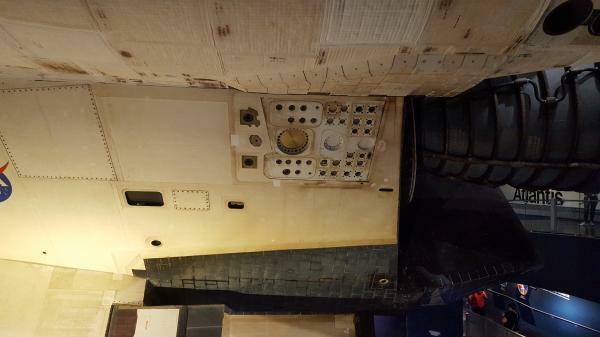 The seal between shuttle doors, the radiators on the inside. "see these round patches? I fixed that." followed by a detailed description of how he did it that I cant possibly repeat correctly. We talked about the landing procedures and crew egress protocol. He showed me which panels to remove to get to the OMS tanks to drain them. He explained the need for cooling and how they had to hook up the cooling system very fast after landing.. I never studied the Shuttle in details and I am sure all these things are thoroughly documented somewhere. But I hadnt known but was able to follow and ask meaningful questions. At the risk of repeating myself, I had a blast at it! We went into details of the stuff. And these guys were happy to be able to do it rather than answering only superficial questions. It was a great time! The saddest moment in these two hours was when a kid, maybe 10 years old, came up to us and asked one of them "are you an astronaut?" He said no, whereupon the kid just turned around. The engineer didnt show any reaction but I felt sad for him. The kid of course is just acting upon expectations and based upon a very simple model of life. In his mind, the astronaut is the cool girl/guy that flies the shuttle. I remember when I was a kid, I didnt even have a recollection that there were other people involved other than the astronauts. Sure someone had build the stuff, but that was utterly irrelevant. That kid could have been me 25 years ago. Its a simple world and thats ok, the gritty details of life will come soon enough. I felt a bit sad for the engineer nevertheless. The engineers that were there are retired. They do these appearances in public on their own time. These guys deserve a ton of credits and respect for that continued service. And if this post comes across like advertisement, so be it, may the KSC VC have many more customers! Beautiful old girl made me cry when I arrived. So happy to finally see her. Question, what is the brown stuff on the radiator panel? I have been fortunate enough to see her twice since Atlantis was put on display, and both times as the screen opened to reveal her, I got tears in my eyes, each time has been so powerful. I want to go back now that they have added the Challenger/Columbia Memorial section on the first level.